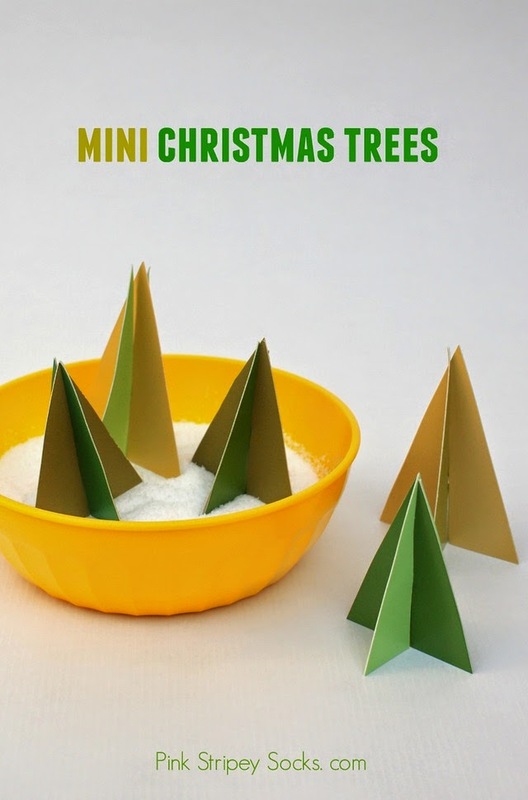 Let's Make Mini Christmas Trees! To make these trees, simply grab a bunch of paint samples. (Free!) Then, fold them in half and glue both halves together with a glue stick. Then, place the folded paint samples under a heavy book. Now you have a double-sided paint sample! Cut out two identical triangles from two different colored paint chip samples. Then, cut a vertical slit through the bottom of one triangle and another vertical slit through the the top of another triangle. Slide the two triangles together to create your trees! It's so easy, you'll soon find yourself with a whole forest of mini trees. These little guys would be perfect for creating little miniature villages, don't you think?